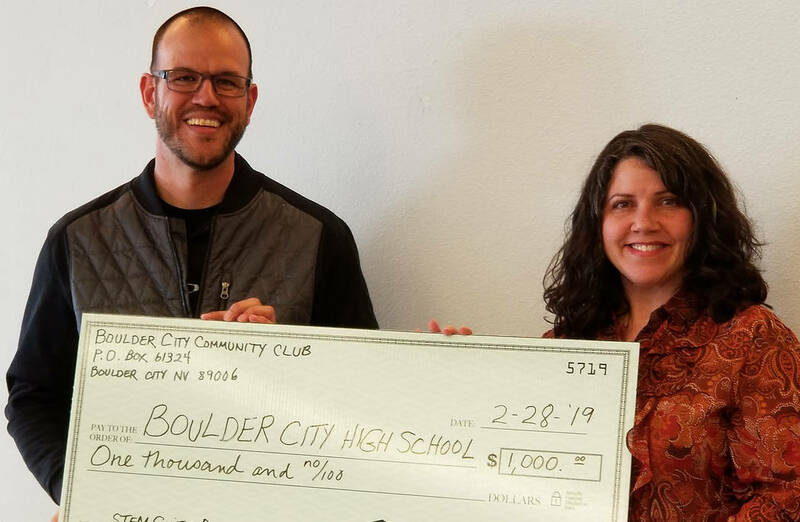 (Boulder City Community Club) Joshua Fisher, who coordinators the STEM guitar program at Boulder City High School, accepts at $1,000 donation from the Boulder City Community Club Treasurer Carmela Santana at the group's Feb. 28, 2019, meeting. The program teaches science, technology, engineering and math principals by building electric guitars. Fisher spoke about the nationwide program about the meeting. ■ Lego challenge, 3:30 p.m. today, March 21, in the community room. For those 6 and older. ■ Romance book club, 6 p.m. today, March 21, at the Dillinger Food and Drinkery, 1224 Arizona St. An appetizer will be provided. ■ Drop-in story time, 10 a.m. Friday, March 22, in the board room. For those birth-5 and their caregivers. ■ Movie, 5:30 p.m. Friday, March 22, in the community room. “A Star is Born” will be shown. For those 18 and older; the film is rated R.
■ Guitars 101, noon. Saturday, March 23, in the board room. Bring your own guitar and learn how to play basic chords. ■ Drop-in coding, 6 p.m. Monday, March 25, in the board room. For those 8 and older. ■ Baby lap-sit story time, 10 a.m. Tuesday, March 26, in the board room. For those birth-24 months old and their caregivers. ■ Crochet for a cause, 2:30 p.m. Tuesday, March 26, in the community room. Learn how to make a sleeping mat for the homeless out of plastic bags. ■ Toddler story time, 10 a.m. Wednesday, March 27, in the board room. For children 2-3 years old. ■ Chess club, 4 p.m. Wednesday , in the community room. ■ Adulting 101: Eating Green: To Spinach and Beyond,” 1 p.m. March 30 in the community room. Learn how to make green vegetables exciting and delicious. Reservations required; sign up at the information desk. Boulder City/Hoover Dam Museum’s Third Thursday lecture series returns with a presentation by Kay Moore titled “Bold Women of Southern Nevada.” It will begin at 6 p.m. tonight , March 21, in the Segerblom Theatre inside the Boulder Dam Hotel, 1305 Arizona St.
Boulder Dam Credit Union is sponsoring the series, “Undertold Stories of Southern Nevada,” which will continue with programs in April, May, June, September and October. ■ Ranger hike, Majestic Canyon, Saturday, March 23. This three-mile hike will travel past vertical cliffs while going through colorful winding washes. Dogs are not permitted. Reservations are required. ■ Ranger hike, Saturday, March 30, Bowl of Fire. This moderate to strenuous guided hike will pass a variety of Aztec sandstone formations. Dogs are not permitted. Reservations are required. “Beautiful Noise: Broadway Then and Now” will be performed by the Red Mountain Choir at 7 p.m. March 29-30 at the Elaine K. Smith Building, 700 Wyoming St. The concert will be conducted by Lisa Gillespie and accompanied by Ashley Peel. The Martha P. King Singers, conducted by LaNette Coker, also will be featured. Tickets are $10 for adults; children and students will be admitted free. Children younger than 5 will not be admitted. Tickets can be obtained at the Boulder City Chamber of Commerce, 465 Nevada Way, or at the door. For more information, visit www.redmountainmusicco.org. Jill Rowland-Lagan, CEO of the Boulder City Chamber of Commerce, will be the guest speaker when the Boulder City Republican Women’s Club meets for lunch today at the Railroad Pass Casino, 2800 S. Boulder Highway, Henderson. The session will begin at 11 a.m.; lunch will be served at 11:45. The area Sons of Norway lodges are hosting a Norwegian folk dance recital at 6 p.m. Thursday, March 28, in the amphitheater at the Boulder City Library, 701 Adams Blvd. The Stoughton High School Norwegian Dancers will present a one-hour show. The troupe, from Stoughton, Wisconsin, has been touring the United States for 66 years in a program that is simultaneously a commemoration of the Norwegian-American folk dance tradition and a travel adventure for the hardworking students. In addition to the public performance, the dancers will present a show for nearly 100 third-graders at King Elementary School. Admission is free, but donations will be appreciated. For more information, call Dave Nelson at 702-415-4764. 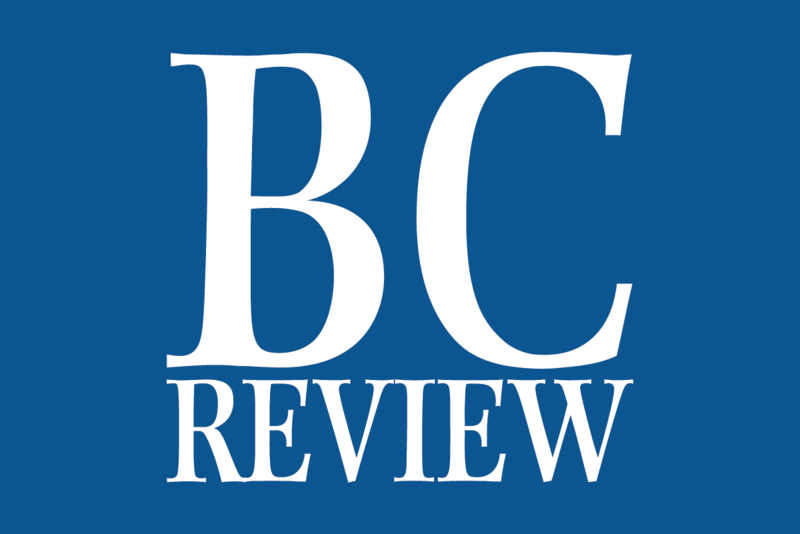 The Boulder City Community Club will hold its next meeting at 12:30 p.m. March 28 in the meeting room at Grace Community Church, 1150 Wyoming St. The room is downstairs and accessible by a ramp east of the church. The club will be holding its annual Trinkets and Treasures sale. Those attending are asked to bring items for the sale and, if possible, to arrive early so the items can be priced. Additionally, officers for the 2019-20 year will be elected. Annual membership dues of $15 will be collected at this meeting and again in April except for those who joined in 2019 and lifetime members. A pizza lunch with salad and lunch will be served for $5. Those attending are welcome to bring dessert. Attendees are asked to call Bev Parry at 702-293-7623 no later than Monday, March 25, to facilitate food and setup planning. A collection of photographs will be showcased by the Boulder City Art Guild in its gallery throughout March. A resident of Kingman, Arizona,, Florisi has more than 20 years of experience as a graphic designer and certified Apple computer technician, which influence her photography.